Protect backflow preventers from freezing or sweating with Thermaxx’s made-to-fit removable anti-freeze insulation jackets. A backflow preventer device protects water (or other liquid) supplies from backflow — the undesirable flow of water in reverse direction. This function is critical to prevent supplies from contamination. 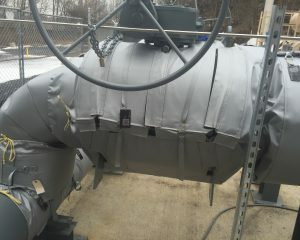 We receive a lot of requests to insulate backflow preventers. We thought we should expand on the topic since it is such a crucial part of any irrigation system. To understand how crucial the function of the backflow preventer is, there are some key terms that need to be understood. A cross connection is any connection between a potable (drinkable) water system and any system containing non-potable water, pollutants, or toxins. An example of where a cross-connection would exist is the piping between consumers’ water systems and an auxiliary water system, a cooling system, or an irrigation system. Backflow is defined as any unwanted reversal of the flow of liquids, solids, or gases in a piping system. Backflow in an irrigation application is when water from the sprinkler system travels “upstream” through the pipes and enters the potable water system through a cross-connection. Back siphonage occurs when a vacuum is created upstream of the backflow device, and water is literally sucked back up the system due to negative pressure. Back siphonage can happen when the water supply is stopped due to a water main break or nearby fire hydrant use. The main types of mechanical backflow preventers include: reduced pressure principle assembly, the pressure vacuum breaker, and certain check valves such as the double check valve and residential dual check valve. Many local codes and federal regulations address backflow prevention, often through requirements of backflow prevention devices and testing. So why insulate? The backflow preventer will fail if the components on the assembly freeze. Backflow is the unwanted water flow into piping systems and is opposite to its normal or intended direction. A drop in water pressure which creates negative pressure in the water supply system causes back-flow. This loss of pressure causes contaminated liquid to be siphoned back into the drinking water through a cross-connection. Back-flow prevention systems block this contaminated water from entering back into the water supply. This ensures that only quality water is used for drinking, bathing and food processing. ThermaXX removable insulation jackets prolong the life of your backflow preventer components by protecting them from the elements. Salt and rain and other chemicals may cause the valves on your backflow to begin to rust. When housed indoors adjacent to other HVAC components, the backflow preventer tends to “sweat”. This can lead to accidents in the workplace not to mention the eventual erosion that can be brought on by ongoing condensation. To protect the life of your component and avoid costly problems caused by contamination, request a quote to insulate your backflow preventer. Unlike other backflow preventer covers, Thermaxx insulates the individual components on your assembly based on their specific design. Your initial investment will protect your components from all the challenges brought on by the elements, outdoors and in the boiler room. Due to their critical function, regular testing of backflow preventers is required because backflow preventers have many internal and moving parts subject to wear, fouling, or damage from the environment. Outdoor backflow preventers may be especially at risk of freezing. Frozen water expands and puts additional stress on backflow preventers and can cause them to break. 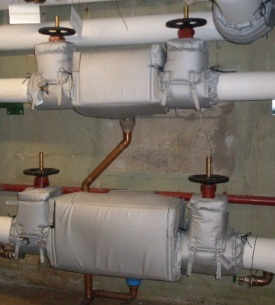 Removable insulation has proven a very effective means of protecting backflow preventers from freezing. This can come in the form hard box-shaped backflow enclosures or, as Thermaxx provides, form-fitting backflow insulation jackets. For harsh winters, heat tracing is often installed to ensure backflow preventers stay in a safe temperature range. 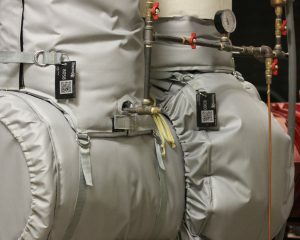 Heat trace ready: Our backflow preventer covers can come with belt loops sewn on the inside of the jackets, so they are ready for installation of heat tracing if needed. The specific closures for this insulation are velcro d-rings. Thermaxx does not supply heat trace but can recommend distributors in your area. Some users don’t require belt loops but ask that the jacket fit snug over the component and heat trace. The right fit: We produce covers for exact fit for many specific backflow preventer assemblies including Watts, Kennedy, and Flowmatic. We use seal flaps to connect the jacket to insulation. 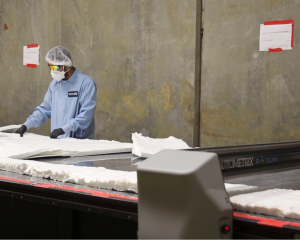 In addition, our skilled technicians and engineers also design jackets to exact specifications for custom jobs. Convenient: Our backflow preventer jackets are designed to be able to be removed and replaced easily and quickly by any personnel. In addition, when heat tracing is installed, the heat tracing comes off with the jacket when the jacket is removed. Cost effective: We’ll provide you with backflow covers that work best for your climate, needs, and device. Size, shape, and thickness are tailored to your needs. Being able to buy exactly the jacket you need means you don’t have to pay for un-needed insulation. High quality: Our backflow preventer insulation jackets are painstakingly designed and crafted to remain effective under harsh conditions for extended periods of time. As with all Thermaxx Jackets, we stand behind our backflow covers with a 5 year guarantee. Got questions? 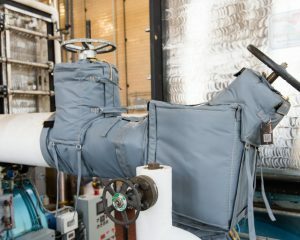 We’re happy to answer any questions you have about our backflow preventer insulation covers or any of our many other removable insulation solutions for your facility.